16 pp. Roman, 142 pp. The Bakweri live on the slopes of Mount Cameroun in South-western Cameroon, with a population of approximately 32,200 speakers. 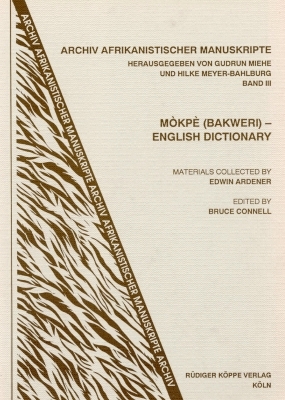 Their language, Bakweri, Baakpe (Guthrie 1953), or typically simply Mòkpè is classified as part of the Bantu family (A.22) and is closely related to Bomboko (A.21), Isubu (A.23), Duala (A.24) and other languages of the Duala group (A.20). Dialect variation is said to exist but has not been systematically studied. The Bakweri refer to themselves collectively as Vàkpè, or Mòkpè in the singular. Mòkpè is a tonal language with two distinctive tones (high and low). The language operates with 21 consonants and a system of seven vowels. Noun classification in Mòkpè consists of 13 nominal classes, grouped into seven genders by means of alternating prefixes. Concord prefixes are found on modifying elements. 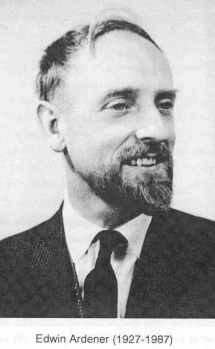 The present material is based on records made by British anthropologist and linguist Edwin Ardener (1927–1987) during his time in Cameroon 1952–1969. The dictionary therefore reflects Mòkpè as it was spoken some forty years ago. As such it is a valuable record of both Mòkpè language and culture at that time. The words contained in the dictionary were verified by Bakweri speakers. The dictionary consists of an English-Mòkpè and a Mòkpè-English section, containing information as to part of speech, translation, singular/plural prefixes and examples of usage.